If you selected more than one storage device on the storage devices selection screen (refer to Section 16.8, “Storage Devices”), anaconda asks you to select which of these devices should be available for installation of the operating system, and which should only be attached to the file system for data storage. If you selected only one storage device, anaconda does not present you with this screen. During installation, the devices that you identify here as being for data storage only are mounted as part of the file system, but are not partitioned or formatted. The screen is split into two panes. The left pane contains a list of devices to be used for data storage only. The right pane contains a list of devices that are to be available for installation of the operating system. Each list contains information about the devices to help you to identify them. A small drop-down menu marked with an icon is located to the right of the column headings. This menu allows you to select the types of data presented on each device. Reducing or expanding the amount of information presented might help you to identify particular devices. Move a device from one list to the other by clicking on the device, then clicking either the button labeled with a left-pointing arrow to move it to the list of data storage devices or the button labeled with a right-pointing arrow to move it to the list of devices available for installation of the operating system. The list of devices available as installation targets also includes a radio button beside each device. Use this radio button to specify the device that you want to use as the boot device for the system. If any storage device contains a boot loader that will chain load the Red Hat Enterprise Linux boot loader, include that storage device among the Install Target Devices. 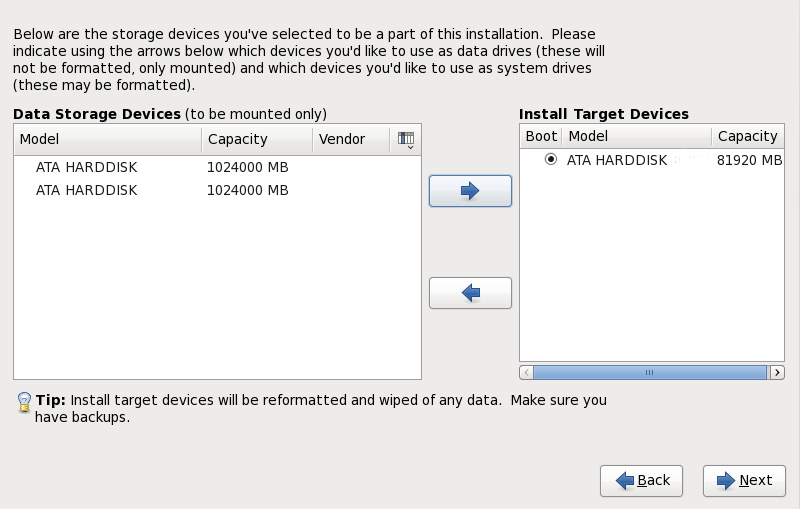 Storage devices that you identify as Install Target Devices remain visible to anaconda during boot loader configuration. Storage devices that you identify as Install Target Devices on this screen are not automatically erased by the installation process unless you selected the Use All Space option on the partitioning screen (refer to Section 16.15, “Disk Partitioning Setup”). When you have finished identifying devices to be used for installation, click Next to continue.